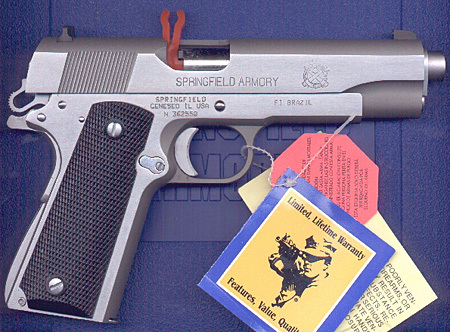 The pictured Springfield 9mm is a single-action, single-stack 9mm pistol in the traditions and styling of the classic Colt M1911A1 pistol. It has an arched mainspring housing, relief cuts around the trigger guard, and an extended beavertail safety. Note the plain checkered black grips as well. The Springfield 9mm pistol has a stainless steel finish and a tritium night sight for the front sight. This sample is brand new and has never been fired by a consumer.